What’s Your True Frame Size? Did you know that your ideal body weight depends on what type of body frame you have? Two people who are 5 feet (1.52 meters) tall do not need to weigh the same weight to be considered healthy. There is a wide range. Ideal healthy weight all depends on your body composition, body shape, and frame size. So, let’s take a look at how to figure out what type of body frame you have! Bend your elbow 90 degrees. You want to take the measurement of the width of the widest part of the bone at your elbow. Simply use your middle finger and thumb to get an estimate, and then check this estimate with a ruler/measuring tape. Check the chart below. Use a measuring tape to measure the circumference of your wrist (the smallest part just above the bone). Then, check the chart below. This is less accurate. Wrap your thumb and middle finger around the smallest part of your wrist. If they overlap, you are small framed. If they touch, you are medium framed. If you can barely get them to touch or they are not touching, you have a large frame. I recommend doing a combination of these measurements get a better idea of your frame size. Start with 100 pounds for 5 feet tall. Add 5 pounds for every inch over 5 feet that you are. With this number you can subtract 10% for small frames, and add 10% for large frames. Start with 106 pounds for 5 feet tall. Add 6 pounds for every inch over 5 feet that you are. With this number you can subtract 10% for small frames, and add 10% for large frames. Or, check out this easy to read chart from ygraph once you know your frame size. Overall, use your judgment when it comes to your weight. At the end of the day, the number doesn’t matter. What matters is where you feel healthy at. Do you know your frame size? I am 5’4″ female who has lost 124 lbs so far, from 285 to 161, and was unsure what my goal weight should be because I have a large frame. Apparently, I only have about 10-20 more to go to be well into the ideal range, which is a relief compared to the charts that don’t take frame size into account. Woohoo! I think this is because you are exercising too much and eating too little. Your body is going into panic mode so at every calorie it eats, it will soak it up. Please eat more and exercise less, you are destroying your metabolism so even if you achieve your goal eventually, once you return to your lifestyle, you will blow up. Once your metabolism stabilises where you eat well and exercise regularly but not excessively, you will naturally lose weight. Hi my name Sarah and I am 5’5 and can’t not reach my weight I just want to be a 100 pounds . I wish I could be 120 that be a dream I work out and eat food too any suggestions? I’m 5’3 and 123lb. I’m a girl.Personally, I think I’m overweight. 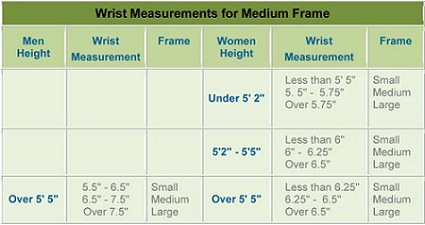 My wrists are 5” and my elbow breadth is 2” so idk my ideal weight should probably be much less. i am 5’11 1/2″ tall and weigh 165. i muscle some in arms more in legs due to jobs i have worked but i do exercise. i am being told by two different men i lost to much weight. Clavicle length doesn’t have anything to do with being big-boned. I think I’m disproportionate XD According to my elbow I’m large frame I’m 5’7 and I measured my bone width at 3in but my wrist is only 6 around which the charge indicates is small frame. So how’s this work as a woman of 6’1” my elbow measures 3” my wrist measures 7 1/2”. I’m not even 9n the chart. It means you have a large frame. People complain that this chart is “out of date” because nowadays it is considered “healthy” just to be 30-40 pounds overweight due to most people considered obese carry around 100 to 200 extra pounds. This chart is spot on. 1. what on earth are the “out of date” comments about? 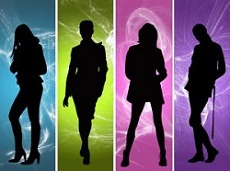 Health weight ranges don’t change with time or fashion. 2. 5’4.5″ with wrist circumference of only 5.25″ puts me off the charts on the tiny frame end. My healthy range has always been between 100 and 106, an “underweight” BMi. Extra weight puts a strain on my joints and yes, also looks bad. Yup, I’m fit. Totally out of date. Wrists are my smallest part but when I was at the weight suggested for this size in high school I looked sickly even though I still was wearing the same sized shirt just to bridge my shoulders… I put 30 lbs back on… Felt better too in the same sized shirt! This is all well and good….. but somewhat misleading/out of date…. There is nothing here that talks about muscle…. I’m 5’1″ (small frame) have weighed as little as 98lbs. However, when I was in the best shape of my life, I weighed about 115lbs…. The difference is muscle… I was strong, lean and looked a lot better. 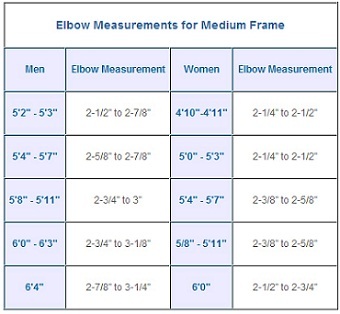 So my elbow measurement is off the chart for both male and female. Now what? I reckon it’s time to loose some weight I guess or you’re the exception to the rule. That chart appears to be just for a medium frame. Mine is off the chart as well, but I have a large frame. I got a tape measure if you need it. Just measure the smallest part of your waist and that’ll show your measurement. Better cut back on them vanilla milkshakes! This totally ignores muscular men. At 5’9”, I weigh between 184-190 year round. With water immersion and caliper body fat testing, I am 12-14 % bf. I have a large frame size and not overweight by any stretch of the imagination. So much for these “one size fits all” charts. Useless, like BMI charts. Who creates this misleading information without consideration of all the variables? It totally ignores muscular women too. I am 59 years old 5’5 142 lbs with 21 % body fat and people tell me I need to gain weight. I have a 7.5 ” wrist circumference, wear women’s 10 or men’s 9 shoe. Unlike the current occupant of the white house I have large hands bigger than most men.